Russia's Nuclear Cruise Missile Is Struggling To Take Off, Imagery Suggests Earlier this year, Russian President Vladimir Putin claimed his nation had successfully tested a nuclear-powered weapon. Satellite imagery suggests it may not have gone so well. The imagery, shared exclusively with NPR by academic researchers, shows ships removing equipment from the site where the missile was tested on a remote, arctic archipelago. Between July and August, blue shipping containers and structures vanished, implying that testing has stopped, at least for now. "Russia seems to be closing up shop," says Jeffrey Lewis, an arms control expert at the Middlebury Institute of International Studies at Monterey in California who led the new analysis. "That suggests to me that the program may be experiencing some developmental challenges." 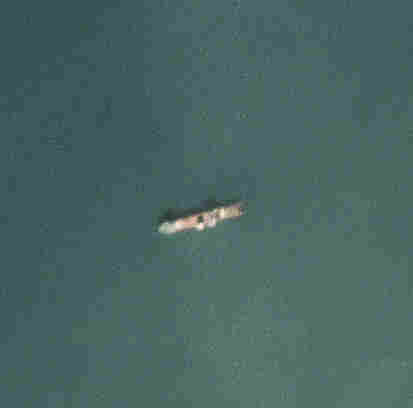 Lewis says that satellites also spotted several ships loitering in waters north of the site in late July and early August. That could have been an effort by the Russians to recover the remains of a test missile that reportedly crashed after flying briefly in late 2017. Both the U.S. and Russia have possessed nuclear-armed missiles for decades, but a nuclear-powered missile is different. Such a missile would fly using thrust from a small nuclear reactor. "It essentially has an unlimited range because it'll fly as long as the reactor is going," Lewis says. But a nuclear-powered missile also comes with more than a few problems. The U.S. briefly looked into the idea in the 1950s and 1960s. But a prototype engine produced exhaust that was highly radioactive. "It was spewing lethal amounts of radioactivity the entire time," Lewis says. In the end, he says, the U.S. decided it was a "crazy idea." "The Russians have apparently decided that it's not a crazy idea," he adds. Russia's Ministry of Defense has released video showing the new, nuclear-powered cruise missile. Russia's nuclear-powered missile was unveiled to the world in March during Putin's annual address to the nation. Putin boasted that the missile had "unlimited range" and could not be intercepted by U.S. missile defense systems. A graphic shown during the speech depicted the new missile flying southward over the Atlantic, and around the tip of South America, then turning north in the Pacific and striking what appears to be Hawaii. He also claimed that the missile had a successful test launch in late 2017. The U.S. intelligence community quickly disputed that claim. According to reports leaked to the press, the Pentagon believes that after a test in November the missile flew for just a few minutes before crashing into the sea. Several other tests also ended in failure. Russia tested the missile in its old nuclear weapons testing ground, a chain of barren islands known as Novaya Zemlya. During much of the year, "it's just covered in ice in the satellite images," says Anne Pellegrino, a research associate at the Middlebury Institute. "It's actually quite beautiful when you look at it." Pellegrino, Lewis and colleagues used photos from Putin's speech to locate the precise site of the launch. They then observed the area using commercial satellites from the company Planet. Combined with ship-tracking data, the team was able to watch as the missile site was being decommissioned in July and August. They also saw ships, including one used to handle nuclear fuel, in the same area where the cruise missile likely went down. The evidence is circumstantial, but it's enough to make Pellegrino believe the missile test was a bust. "I think that it was a spectacular failure and fell into the ocean," she says. 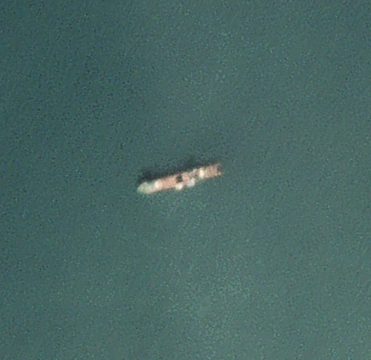 In July, satellite images spotted the Sevmorput, a nuclear-powered container ship, in the area where the missile may have gone down. Failure or not, Lewis says the test should be concerning. "This is a resumption of the arms race," he says. The U.S. and Russia would be better off if they could "negotiate an arms control treaty that covered a lot of these weird systems that belong only in science fiction." There are, of course, other possibilities for what's happening at the missile site. Lewis and Pellegrino say that it's possible that testing is moving to another location, although neither believes other test sites would be safe enough, given the radioactive nature of the weapon. Winter is also coming to the island chain, and Russian officials may have just decided to clean up ahead of the snow, says Pavel Podvig, an arms control expert who runs a blog called Russian Strategic Nuclear Forces. Even if the missile did fail, Podvig says, the program likely lives on. After being mentioned by Putin himself, Podvig says, there would be enormous pressure to push through failure. "I would guess, given the high profile," Podvig says, "that the system will return in some shape or form."